Back in January we headed up to Sheffield to stay with our little sister who is up there at University. She’d just finished her exams so it was the perfect opportunity for us all to hang out together and for Lau and I to get a guided tour of the city having never been there before. About a week before we went up I received a text from her which included two photos, both were pages from a recipe book with the text: ‘These are amazing, you should make them one day’. It didn’t take a genius to realise that she meant – I want these. Make them for me when you come and stay. Or else you can sleep on the floor. Well maybe she wasn’t quite that rude and I may have assumed the sleeping on the floor bit, but none-the-less we decided we should probably give them a whirl! After all the cookies sounded delicious and the only thing that would improve a catch-up with siblings is biscuits. We did make a few amends to the recipe as we have a little sister who’s not a fan of pecans and we didn’t have any white chocolate to hand, but I think the changes work really well and you end up with a beautifully moist and chewy biscuit – perfect with a mocha and a chat! I think these would also be good with raisins, marshmallows and almonds, so I might try a different combination next time. Any thoughts on what else might work? Do you remember the Great British Bake Off send off back in October? Well we actually did a similar sort of think last week, but Disney themed. Yes Disney, that film and movie institution! It all came about after a long argument discussion with friends about the best Disney films, it was revealed that certain members of the group had not watched Mulan, I know right – travesty or what! To combat this epic error we decided to have our very own Disney Marathon with, you guessed it, Disney themed food. There were treats galore including Princess cupcakes, Ratatouille quiche and Popeye pastries (yes someone actually thought Popeye was Disney)! But what did we make, well Fi created some Ursala Mac n Cheese’s and Princess popcorn – yes you’re right we basically made whatever we wanted and added the word ‘princess’ to the dish name! Fi will of course be talking about these at a later date, but in the meantime you get to hear about my Minnie Mouse cupcakes. Yes Minnie Mouse, she is the best Disney character after all. I’ve actually owned both a Minnie Mouse inspired dress and Minnie Mouse ears over the years, and yes I may also have Minnie Mouse shoes still. So to say I’m a bit obsessed is an understatement, so of course I was going to be making cakes around this mousy lady. To be honest these cakes are super easy – not least because I used a box of Betty Crocker’s Red Velvet Cake mix to make the actual cake part – what can I say, I was being lazy. But these cake mixes are perfect as you honestly can’t go wrong with them. Literally empty the mix into a bowl and add 3 eggs, water and oil, mix together and bake. Now comes the fun part – decorating! We set up a sort of decorating station at our coffee table so we had a bit of a production line and then got decorating. I’d ordered red and white spotted bows and cupcake cases via amazon so it was a case of spreading each cake with vanilla icing (via Betty Crocker again) and then adding one big oreo flat onto the cake (for the face) and two mini oreos standing up for the ears. Top with a tiny bow and voila Minnie Mouse is in the house! Here at Cook, Bake and Eat Towers we’re being thrifty, which means buying things that aren’t essential is a no-go. And apparently cookie cutters, ceramic jars and other pretty, and not to mention practical things, are off-limits for the time being. Very sad times indeed! As is often the case as soon as I’m not allowed to do something I have a huge desire to do it. One that just won’t be ignored. So rather than allowing myself to go crazy with my credit card – as that would be against our January and February thriftiness – I’ve decided to pull together a bit of a kitchen wish list. Below are all the things I want to buy right now but won’t, but when it’s non-thrifty March who knows….. Both Fi and I are a little bit obsessed with granola. We love the crunchiness, the fruit and the idea that it’s slightly healthy (unless you have a humongous bowl of course)! Fi’s favourite way to eat it is with cold milk and slices of banana while I enjoy it with Greek yoghurt – it takes away some of the crunch you see. Either way it’s pretty much a staple in out flat. Personally I get bored of having the same things too much, so when it comes to granola I have to constantly change what we purchase so that I don’t get bored. We flit between supermarket own brands, Jordan’s and Dorset Cereals as seriously I have no idea what I’d eat each morning if this crunchy goodness suddenly became too boring. 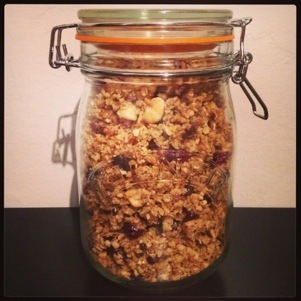 In the past we would start talking about making our own granola every now and again but we really got anywhere with it, as it was always easier to just buy one of our usual bags. Until that was we stumbled across a post by Miss Thrifty about making granola, well we thought, clearly now is the time to try this out. So we did, and promptly lamented over the fact that we hadn’t got around to making it earlier. You see it was soooo good, really easy and we’ve not bought the shop bought kind since. This recipe is based mainly on the one that Miss Thrifty suggested (see it here), with only a few changes. For the fruit and nuts just use whatever is in your cupboards, the first time we made it this is what we had – leftovers from some biscuits we had just made of course! Bake for 1 hour, making sure you take out and mix every 15 mins – this is to ensure you don’t get flapjack. 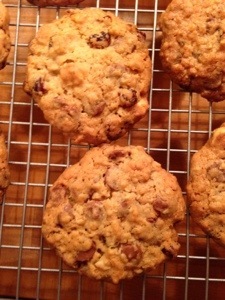 You want it to be a golden brown colour – basically it needs to look baked like granola! 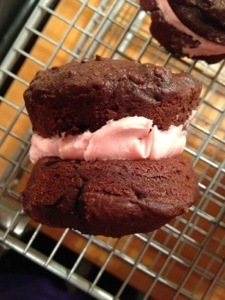 Recently I made some Whoopie Pies to help soften the blow when a friend returned to work after her wedding. She’s been a big fan of them since I first made them for work peeps way back in December 2011, and has been put out ever since that I haven’t made them again! For the wedding celebration version I didn’t play around with our original whoopie pie recipe too much, as they are delicious just as they are. All I did was make the buttercream pink, which actually went down a treat, much to my pleasure. I realised two things after everyone’s reaction; firstly everyone loves these gorgeous treats of deliciousness (including me) and secondly I don’t make them often enough – once a year is nowhere near enough! Let’s be honest they aren’t tricky or expensive to make as all the ingredients are usually in my fridge/cake making cupboard. With this thought in mind I wanted to share some of the whoopie pie recipes I’ve seen recently, with the promise that I will make some of these soon. Choc-Mint Whoopie Pies – chocolate and mint is one of my favourite flavour combinations so these are a must I think! Peanut Butter Whoopie Pies – Another classic flavour combination, perhaps second only to mint and chocolate! Red Velvet Whoopie Pies – I don’t know about you but I always think here’s something sophisticated about red velvet anything, and as I’ve never made anything that’s red velvet before I think I might start with these! Raspberry-Lemon Whoopie Pies – I’m intrigued by this flavour combination. As raspberries and lemons always make food taste very fresh, but I’m intrigued as to how that would work in a cakey item like whoopie pies…. Gingerbread Whoopie Pies – I love ginger biscuits and gingerbread cake so there’s no reason why I won’t absolutely love Gingerbread Whoopie pies as well! Banana Whoopie Pies – Now I know Lau will loathe these with a passion as they feature bananas, but I will still have to give these a whirl as I adore bananas in anything and everything. I always feel I’m being healthy when a banana is involved, even if I’m clearly not! What do you think, are you inspired by the above ideas? I for one can’t wait to get started!